This morning I gave a very quick demonstration of various techniques with Brusho Crystals and didn't want to waste this flower. So I cut it out and adhered it to one of the smaller cards in the Petal Passion Memories & More Card Pack. I've hidden the word "Happy" with the flower! 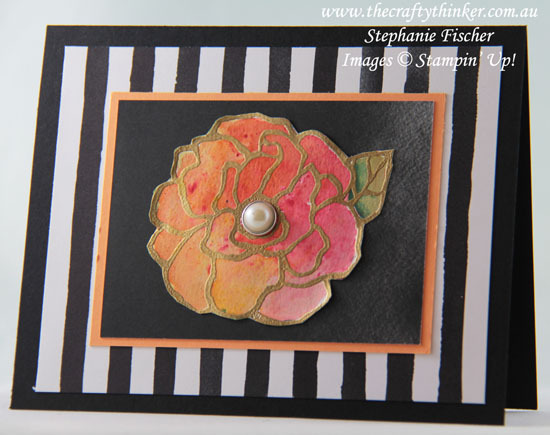 The black & white provide the perfect foil for the Brusho coloured flower. The striped paper is from the Petal Passion Designer Series Paper pack and I added a layer of Peekaboo Peach card as well as the Metal Rimmed Pearl. It's a very quick card!